Most animals who come to live at SASHA Farm Animal Sanctuary have not had an easy life. Equines have come with sway backs and overgrown hooves. Pigs have come overweight to the point they cannot walk. We have welcomed run-away cows, and goats with sawed-off horns. They all come with no trust of people and it can take years for these animals to trust us. Izzy was no different. Izzy came from a puppy mill in northern Michigan. As a Great Pyrenees, she was constantly bred in horrific conditions for her “financially lucrative” pups. Never given a break and kept in a small, dirty cage, she was bred, delivered puppies, had them taken from her too soon, bred again, and again, and again. Izzy was approximately four years of age when she was rescued and came to live at SASHA Farm. She received immediate medical care and lots of love. Unfortunately, one of her eyes had to be removed due to the lack of medical care she received while at the puppy mill. Her suffering was officially gone because we were not going to let her be trapped or bred again. Izzy’s happiness while running and playing in the large pastures at SASHA Farm made everyone smile. In no time, Izzy became the guardian of the gate at SASHA Farm. Her instincts blossomed and she was protector of the sheep, goats, and people – whether they wanted it or not. She loved any toy she was given. Sometimes she loved toys by destroying them. Sometimes she loved toys by tossing them in the air and pouncing on them. Her mood dictated how the toy would be loved. After her position as “Gate Guardian” was secure, she expanded her farm role to include “Produce Taster”, “Play Police”, and “The Paw”. Izzy made sure the produce being fed to all the residents was fresh and delicious. When other animals played, she stood watch until she decided that they had played long enough. “The Paw” was Izzy’s signature move. Simply put, Izzy told everyone when they were allowed to stop petting her. If someone stopped prematurely, that person got “The Paw”. Time crept on and Izzy began having difficulty walking and breathing. Last week, Izzy passed away, surrounded by those who loved her. She is now at the Rainbow Bridge and she is joined there by some of her pups. She gets to spend time with them and play without the confines of a dirty cage. We love you and miss you, Izzy. You are now the Gate Guardian at the Rainbow Bridge. Do what you do best – protect, love, and play. 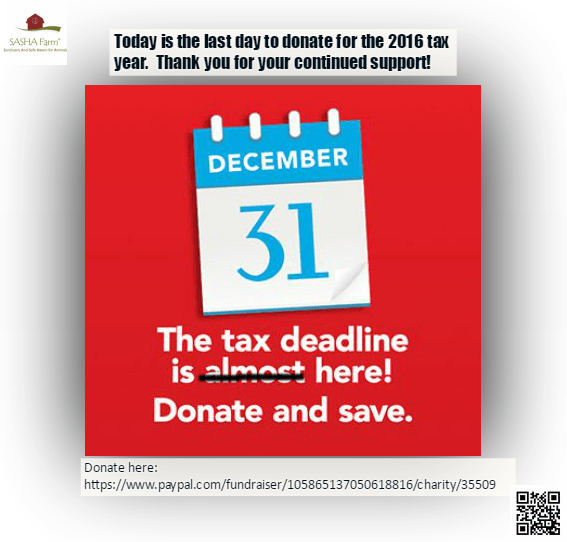 Today is the last day to donate for the 2016 tax year. We can’t thank you enough for your support this year and in years passed. Without the support of our donors, we would not be able to continue our mission of rescuing abused and neglected farm animals. If you have a PayPal account, you can donate through this link. If you don’t have a PayPal account, you can donate without opening an account and this link allows you to do that. SASHA Farm is a 501(c)(3) non-profit organization. Donations are tax-deductible. To donate via check, please mail the check to SASHA Farm, P.O. Box 222, Manchester, MI 48158. Update as of July 8, 2017: We are no longer in need of produce volunteers. We will be sure to inform you if our needs change. Thank you for considering a volunteer position with us! Please click on the Volunteer Information link to learn more about our other volunteer opportunities and how you can help. Thank you! Our animal residents love their fresh produce treats. Unfortunately, we don’t have produce volunteers to cover Monday through Friday and the residents have voiced their displeasure about it. 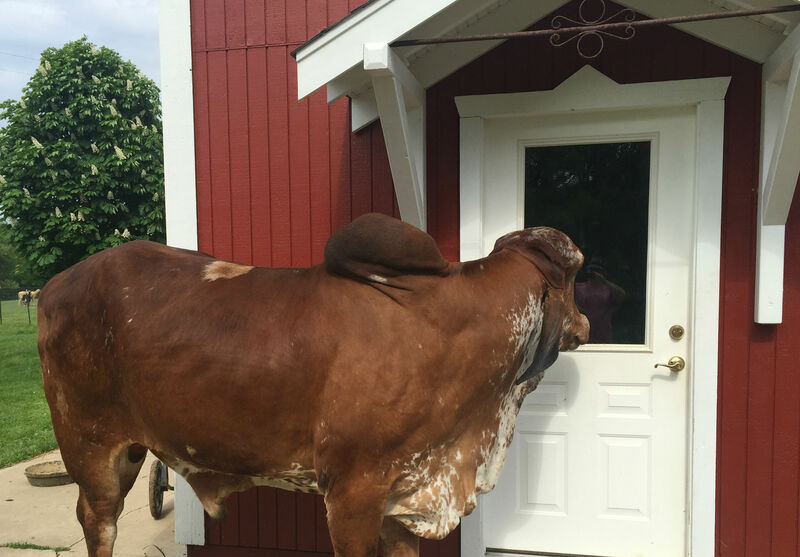 Bhima, our resident Gyr ox, is Produce Distribution Management. If you are interested in volunteering with rescued animals but didn’t know how you could help, being a produce volunteer might be a good fit for you. The produce volunteer must be at least 18 years of age, reliable, courteous, professional, strong, and have a vehicle large enough to transport large amounts of produce from the Whole Foods Market Ann Arbor stores. The produce volunteers’ duties include retrieving produce at two Whole Foods Market Ann Arbor locations, maintaining a courteous and professional relationship with Whole Foods Market employees, delivering the produce to the sanctuary in Manchester, chopping, sorting, and distributing the produce to the eagerly awaiting residents. Please be realistic about your availability and willingness as this volunteer position takes time, dedication, and commitment. The produce volunteers report directly to Bhima, the Produce Distribution Manager. Produce volunteer is known as the best volunteer position at the sanctuary. This is not an easy position, but the produce volunteers get the best form of gratitude -nuzzles and sloppy kisses from the animal residents! They look forward to seeing their produce volunteers, and they stand by the fences and voice their excitement very loudly.